Sweet potato flatbread is easy and simple to make and you get delicious, healthy, quick and colorful flatbreads which you can enjoy with sides or use these flatbread for making wraps or burritos for a change. Adding butter or ghee on prepared flatbread like I have done is totally optional, but its totally delicious as well! You can call this sweet potato flatbread as sweet potato chapathi, sweet potato roti or sweet potato paratha as known in India. When my older son was a baby, he loved sweet potatoes in its mashed form. But now as a boy he wouldn’t touch it, but both my kids love these sweet potato flatbread so its an easy to way to get toddlers or small kids to eat the sweet potatoes with this kid friendly sweet potato flatbread recipe (since you can easily sneak them in these parathas) even if they don’t like them in the mashed form. The sweet potato flatbread recipe uses fresh sweet potato which is boiled, peeled and mashed which is then mixed with flour to make the dough for making flatbread. I didn’t even use water to make the sweet potato roti/chapathi dough (though I used water to cook the sweet potato) since the mashed sweet potato has enough moisture in it to make the dough. It is so simple, easy and quick! You can just mix the cooked mashed sweet potatoes with the flour to make the dough, which is then divided into almost equal sized balls, which is then rolled and cooked to make delicious and colorful flatbread. 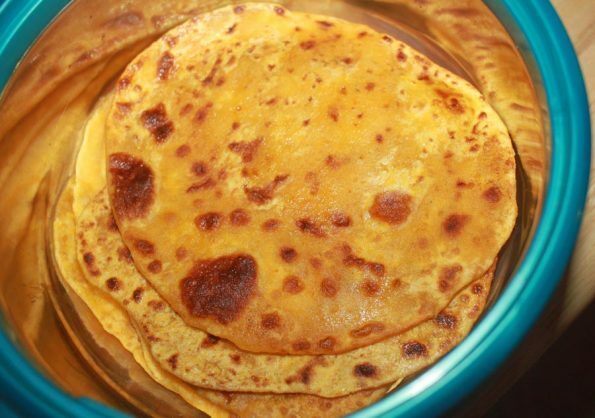 I used all purpose flour to make this sweet potato flatbread, but you can also use atta flour which will help you to make Indian style chapatis or rotis. 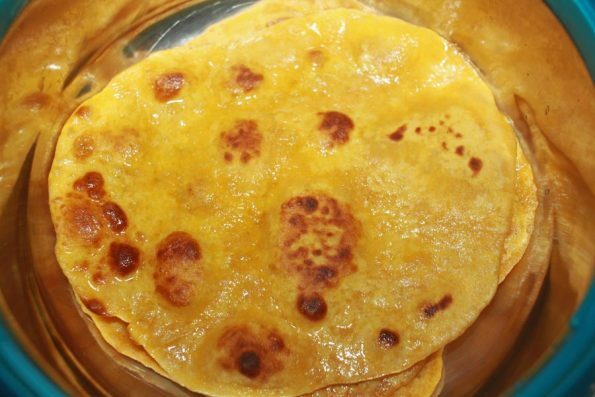 Depending on the kind of flour used including the brand and also the size of sweet potatoes and its moisture content, there may be slight variations in the amount of flour you will need to make the dough but you can always add more flour as needed until you get the right consistency of the dough to prepare the flatbread or rotis. Also based on the size of the sweet potato that you use, the amount of flour and also the size of the flatbread that you make, the number of servings can slightly vary, though you should be able to make anywhere from 8 to 12 number of flatbread from one sweet potato. 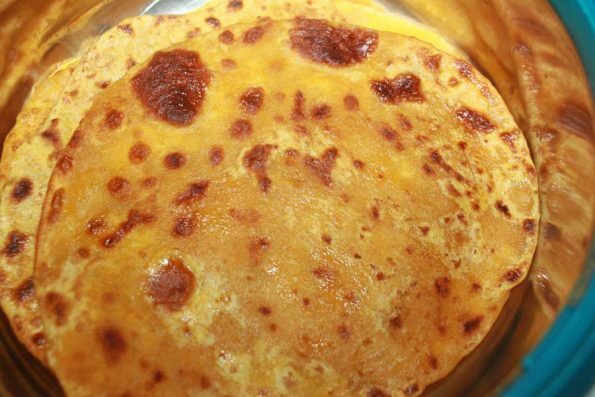 So here is how you can easily make sweet potato paratha or roti following this easy sweet potato flatbread recipe. 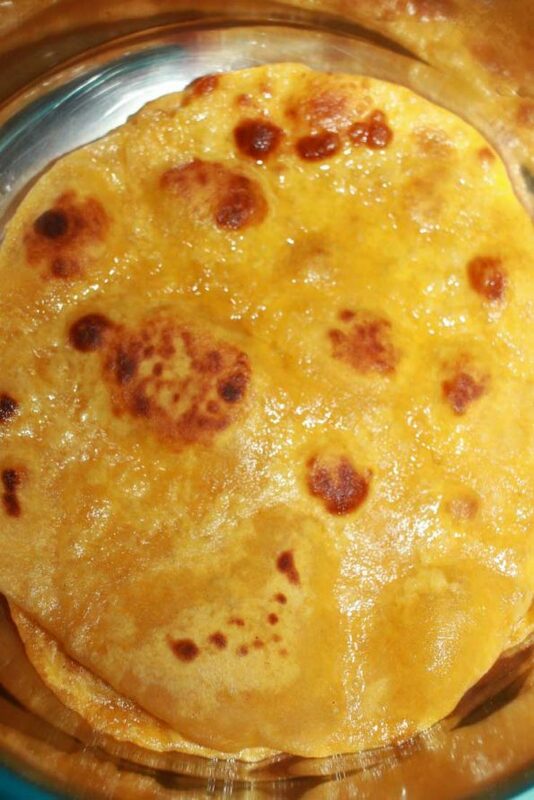 easy, healthy and tasty sweet potato rotis or parathas. Place the sweet potato in a pressure cooker with enough water to cover the sweet potato, close with the lid and cook for 2 whistles or about 10 to 12 minutes of time. Allow the pressure cooker to cool down. Once the pressure cooker is cooled enough, open the cooker and transfer the cooked sweet potato from the hot water, wait for it to slightly cool down. Once its cooled enough, peel the sweet potato (the skin comes off so easily! ), and transfer the peeled sweet potato to a large bowl. Mash the sweet potato using a potato masher or a large spoon or mash using your hands. It is easy to make the flatbread if you mash it well. Add the flour and enough salt to the bowl, mix well and knead to make the dough. If needed, you may add more flour little by little until you are able to form the dough. Let it rest for a few minutes, keep it covered until ready to use. Once you are ready to make the flatbread, make equal sized balls out of the prepared dough. Take the first ball, dust it with more flour and roll it in a flat surface using a rolling pin. Heat a greased pan or skillet (or use a non stick pan) and transfer the rolled flatbread. Add a little oil (or ghee or butter) cook for about a minute or until the bottom side is cooked. Flip the flatbread and cook the other side too. Keep the heat in medium and adjust as needed as the pan gets hot. Transfer the cooked sweet potato flatbread to a serving dish. Similarly roll all the balls and cook all the flatbread. 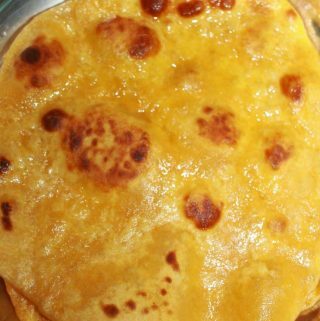 Serve the delicious sweet potato flatbread hot with more butter or ghee or any curry as you wish, or use it for wraps or burritos as you wish! Hope you found this post on sweet potato flatbread recipe helpful in making easy, delicious and healthy sweet potato roti for breakfast or dinner.